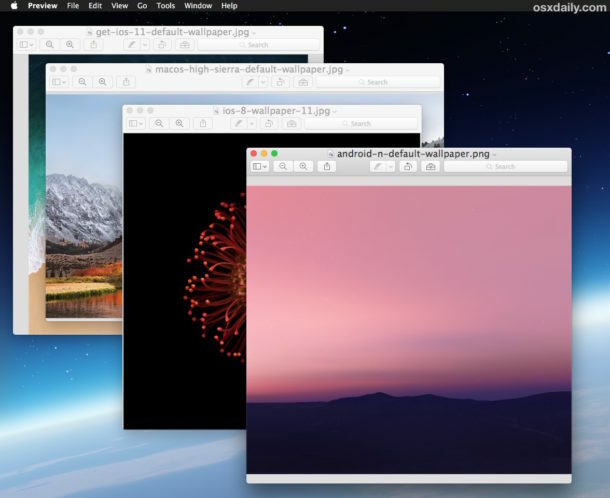 If you open multiple images into Preview on a Mac with some regularity, you may notice that sometimes pictures are grouped into single windows, and sometimes images are opened independently each into separate unique windows. If you’d rather all images be opened into a single window of Preview app on the Mac (or into unique windows for that matter), you can make a settings adjustment to achieve this. This is a simple usability adjustment that can make the Preview image viewer on the Mac a bit less cluttered. This capability is best used with thumbnails in the sidebar of Preview, so if for some reason you are hiding those be sure to enable the thumbnail viewer as part of the Preview app by clicking the sidebar option in the Preview tool bar. Of course if you like the default behavior of opening groups of files into the same window, meaning some files will open into into separate windows and some will be grouped, you can return to the Preview preferences and set that with “Open groups of files in the same window”, or you can cause every single file and image to open into a unique separate window with “Open each file in its own window”. For some quick background, Preview is the default image viewer in Mac OS, which can not only open and view pictures and photos but also make edits, add text captions, convert pictures, resize pictures, rotate, crop images, fill out pdf forms, sign documents, batch convert image formats, import photos from cameras, and so much more, it’s really one of the better under appreciated apps on the Mac. Terrific! I often wondered why Preview would sometimes open some pics in one window, and other pics in another. Though, I found, if I quit out and re-opened once or twice, they would eventually all open in a single window. My setting had been “…Group..”, however, there was often no rhyme or reason, except, perhaps, the first few shots of a time lapse set. I expect it ought to work more consistently now. Don’t forget about TextEdit… Which used to be a really useful editing tool until they forced that auto save on us! Very good, a basic tip that I did not know. Thanks for this! It will definitely make my life easier! 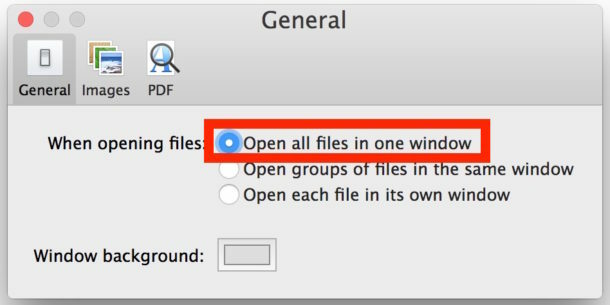 Another way is leave the preference alone and if you find you have a dozen preview documents open, from the marque… Window/Merge All Windows. Now they are all in one using tabs! This has never worked in all the years Preview has been on my computer, through all the updates, through all the clean installs. The fact that it would open into multiple windows when I select multiple documents then strike cmd-O to me seems like a bug in the first place, inasmuch as there’s no rhyme or reason for which picture opens into which window. 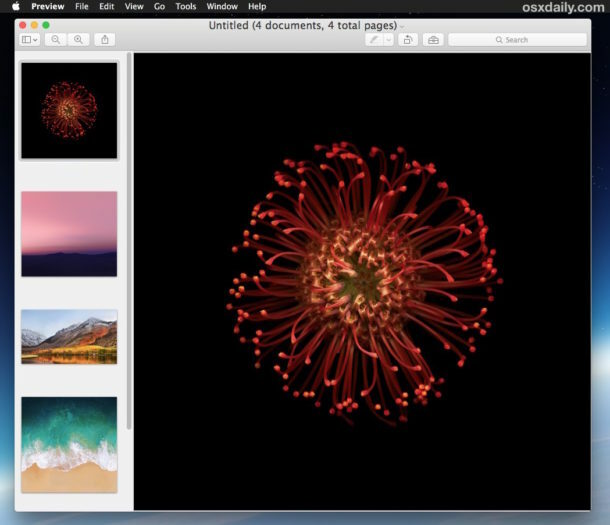 I have stored all my photographs to the iCloudDrive, did exactly what this tutorial said and still, I cannot view all my photographs as explained above. I have Preview Version 10.0 (944.1) running in OSX High Sierra Version 10.13, and this doesn’t work. The option to open all files in one window is currently only under the images tab, not the general tab. I used to be able to open all files — images and pdf’s — in one window, but no longer. There is the option to “Merge all Windows,” but it puts each PDF in a separate tab in that window. Does not work with PDF under High Sierra. But it did so with Sierra. Lost this functionality on the upgrade to high sierra. No longer able to open multiple files in one preview window. Apple, please fix ASAP! Exactly! Not working in High Sierra. Very irritating. Every week for 5 years I’ve depended upon Preview set to “Open all files in one window”. Now in High Sierra this no longer works. Every MacOS upgrade brings some loss of functionality… and with OS 10.13 I’m sorry it had to be this feature. I know Apple will never fix it. click “Window” , and then click “Merge All Windows”. Then you have one window with tabs too all of your desired documents. yeah… but that’s not what we’re looking for.. I get that some people regret upgrading, but my hand was forced by software that became incompatible (following their own upgrades..) and once again I am dropped into these workflow dilemmas. The like of which don’t make any sense to those of us on the ground… Remember the deletion of the Hand tool..? and removing the “save as” option…? Preview merge function works in os high sierra! Open pdf documents with preview (start with first page of document), click ‘view’ tab, and then click ‘thumbnails’. You’ll actually be dragging your files into the thumbnail sidebar from the ‘open’ file window. Try it out. Very irritating! Will not upgrade my Macbook. I use this feature for long time as recently when selecting multiple images those are opened in Finder…. The screen view is offering to open the image in Preview (a box in top right corner). When opening in Preview just the actual image is displayed, not all selected. How to restore the original function please?